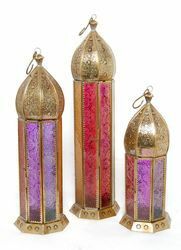 Description : Brass Lanterns: Exquisitely crafted from finest brass, this lantern reflects a soothing, glowing light. Iron Lanterns With Mosaic Decorative Glass. We offer a wide range of Lanterns in Iron, Brass, Stainless Steel. It is in very good original condition with original hanging hook. It all looks to be in good and complete condition including the gauze. We are the leading manufacturer of a wide range of Brass Lanterns. These designs are highly appreciated for its superior finish and beautiful designs. 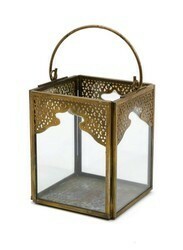 A very beautiful shaped brass Moroccan lantern. Super elegant and will handle wet areas such as bathrooms or outdoors. Beautifully handcrafted in Marrakech, Morocco. Puts out a beautiful filigree pattern if you use a clear light bulb. We introduce our business as a notable entity of qualitative array of Designer Brass Lantern. Backed with the team of highly qualified professional, we offer Brass lantern of fine quality. It is used in temples and can also be used in homes for religious purpose.